Monday March 12th 1883 We did a big days work a large washing and in the afternoon I did some baking and prepared things for supper. Mothers arm continues very painful she only feels able to be up part of the time and I have to change the poultice on her arm frequently. We had a letter from Ott tonight. Mr Hayman went west this morning Tuesday March 13th 1883 We got the work done up pretty well in the morning, just at noon Dr Moon came to lance Mothers arm I got very nervous over it. She will get better now for it discharged very freely. 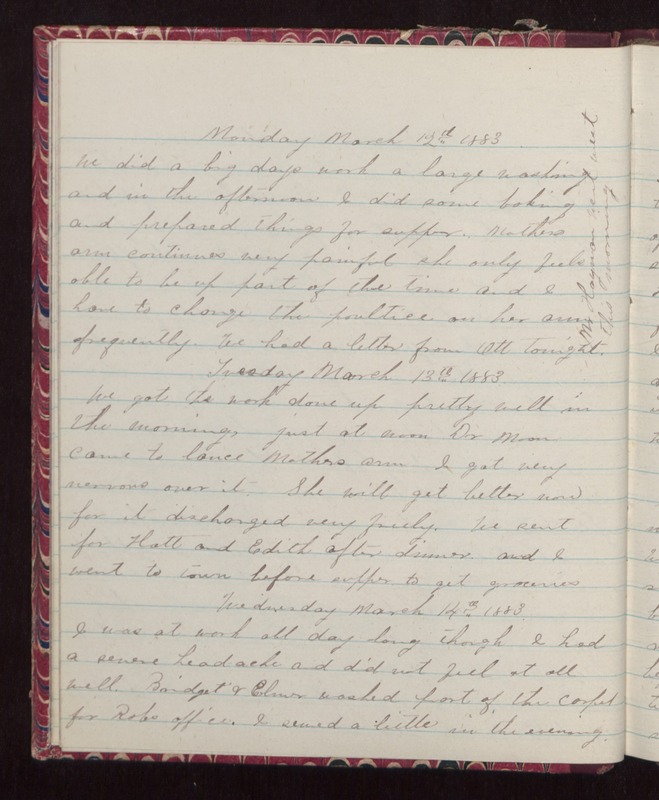 We sent for Hatt and Edith after dinner, and I went to town before supper to get groceries Wednesday March 14th 1883. I was at work all day long though I had a severe headache and did not feel at all well. Bridget & Elmer washed part of the carpet for Robs office. I sewed a little in the evening.